How many times has one of the Kardashions hyped up a piece of clothing that the world had never clinged to? When Kylie rocked the neon yellow hair or when the Kardashions obsessed over bodycon dresses. However Kim seemed to be the real fire starter when it came to cycling shorts which Kourtney joined in with too. Hailey Baldwin also was spotted sporting a pair of leather cycling shorts alongside her (now) fiancé Justin Bieber. Being the model that she is, I find it no surprise to see her rocking a pair! Do you like this leather look or do you prefer a bit of a more basic style? I really am not sure. Bella Hadid even wore them! Styled along-side a checkered blazer and a pair of black heels finishing it of with a black berau and some tiny black shades. A very powerful and determined look. Personally this is my favourite way in which a pair have been styled. To conclude, cycling shorts were a huge hit last summer, personally I never tagged along with the trend but that’s not to say that it doesn’t look good on some people. Styled with the right outfit I think it can look incredible! 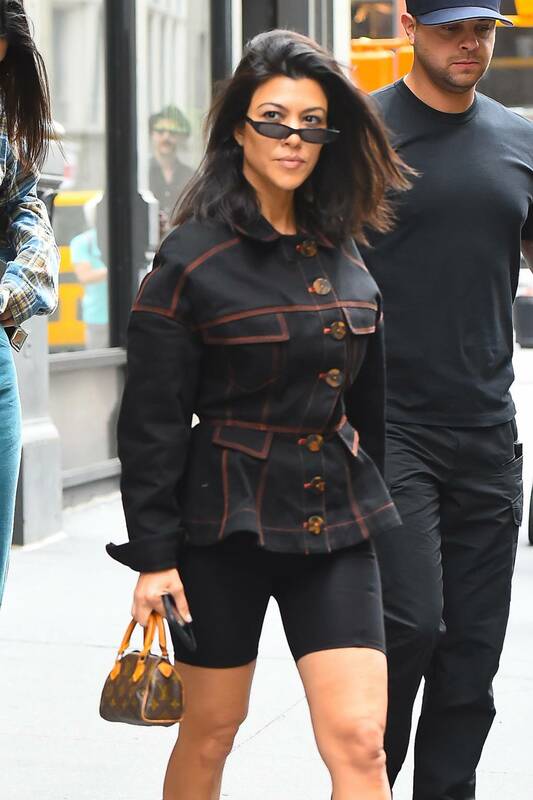 I have linked a pair of super cheap cycling shorts if you want to give the trend a go and look as stylish as Kim did! Great post! Not sure about the new trend either, but certainly look good in the photos.